Double Dribble was the second basketball arcade game developed and released in 1986 by Konami, following Super Basketball. The game features 5-on-5 action on a horizontally scrolling court. Much of the game's popularity came from its animation sequences showing basketball players performing slam dunks, as well as "The Star-Spangled Banner" theme during attract mode, which was the first arcade game to feature the national anthem. These were uncommon in video games at the time of Double Dribble's release. While successful in the arcades, the game became and remained popular and remembered when it was ported to the NES in 1987. When brought home for the first time, Konami released the game on the Famicom Disk System in Japan under the name Exciting Basket (エキサイティング バスケット, Exciting Basket? ), to make it part of Konami's Exciting Sports series. The game featured background music not present in the American release of the game, which was released on the NES in September 1987. These home versions introduced four different teams (Boston Frogs, New York Eagles, Chicago Ox, L.A. Breakers), three levels of single-play difficulty, and four different choices of quarter lengths. 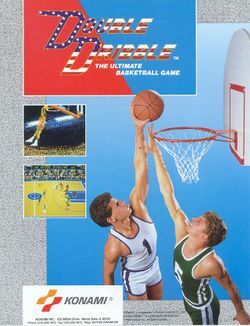 Double Dribble was among the first games to feature cut scenes, which depicted a mid-air player completing a slam dunk, and one of the first to use computer generated speech, though in a limited quantity (such as announcing the game title, the game's beginning jump ball, and some foul calls). In 1990, the game was ported to three home computers: the Commodore 64, the Commodore Amiga and MS-DOS operated PCs, and was based on the Famicom/NES versions more than the Arcade version. In 1991, a Game Boy version was released titled Double Dribble 5-on-5. A Sega Genesis version was released in 1994 titled Double Dribble: The Playoff Edition (known as Hyperdunk in Japan and Europe). The NES version was ported to the Wii's Virtual Console in Europe and in North America in November 2007. A remake titled Double Dribble Fast Break was released as an online exclusive, which is based mostly on the NES version; however, the animation sequences were ripped from the arcade version. This page was last edited on 18 December 2013, at 02:20. This page has been accessed 14,170 times.